Round of 16 had its first two games today, let us recap all the action for you. The game started in such high tempo and it was obvious that Brazil was looking for an early lead that would get the fans involved in the match and be a true 12th man. They need their home field advantage if they were to defeat this strong Chilean side. It was a cagy affair for the first 5-10 minutes of the game with a lot of fouls from both sides, and it looked worrisome for Brazil when Neymar was brought down in the middle of the field and needed medical treatment. He looked like he had injured his knee and it didn’t look like he was 100% from it. If had to leave the game that early with an injury would have been a huge blow for the Brazilian hopes of advancing to the next round. He was able to continue and that was a good sign for Brazil. Brazil continued to push forward at a very high pace, able to have extremely quick transitions from defense to offense and Neymar’s speed was the main reason for it, since Hulk was absent from the game. Chile was more concentrated on holding Brazil off, and looking at exploring organized counter attacks when Brazil was dispossessed in their own half. We didn’t have to wait long for a goal, and in the 18th minute from a Neymar corner, Thiago Silva deflects the ball with his head to the second post where David Luiz shows up to finish it with his thigh. It was a very un-orthodox goal, but a goal that counts and gives Brazil the lead. It was a deserved lead from Brazil that had looked like the most dangerous side. Chile needed to get an equalizer before halftime if they were to continue in this game and have a chance at advancing. Almost 15 minutes after Chile went down a goal, Marcelo has a throw in near his corner flag that Hulk miss plays and allows Chile to regain possession, cross it into the box where Alexis Sanchez shows up with no marker and puts it in the back of the net. Not sure Julio Cesar could have done any better, his defenders and specifically Hulk had let him down. There were 10 minutes left in the game and we had a 1-1 score, but Brazil was looking to regain the lead before the break. Neymar was involved in two of Brazil’s best chances of scoring the go ahead goal. First he quickly sprints into attack after Chile lost possession in the midfield. He loses control of the ball in the penalty area, while surrounded by two defenders and Fred that is arriving late, hits it with his left foot over the bar. Neymar had also a header that went only inches from the post, but they weren’t able to getting anything from those chances and both teams would go into the half tied at 1. The second half started almost in a similar fashion as the first one, with a few fouls from both sides. Brazil looked better in the first 10 minutes, with very good ball control in the midfield, and well organized attack. Brazil’s superiority during this period almost resulted in a goal. Hulk chests a ball in the penalty area and taps it in out of the reach of Bravo, but Howard Webb called it back for a handball by Hulk and the goal was called off. Hulk saw a yellow card on the play for his handball, but the replays were not clear if indeed it was a handball. After that play Chile took over the game, they took it to Brazil and looked extremely dangerous, specifically by Alexis Sanchez who has been their best player. Brazil was pushed into their own half and was forced to play long balls forward since they were unable to play the ball on the ground and pass it around like they normally do. 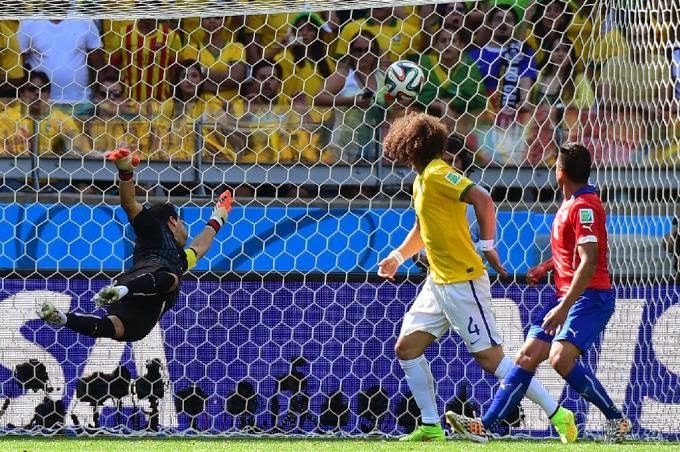 Chile’s high lines pressing close to Brazil’s penalty area was causing Brazil a lot of problems. During this period of Chile dominance, Brazil still managed to have two great goal opportunities. First it was Neymar with an open header in the 79m that Bravo was able to stop with ease, and Hulk in the 84m with a shot from short range that Bravo responded with an incredible save. The last 5 minutes of the game it was all Chile, and you felt that if someone was going to score it would be Chile. It wasn’t meant to be and the game ended in a 1-1 draw. They would have to go into extra time to find a winner. The 30 minutes of extra time brought a strong Brazil that decided that they wanted to resolve this game before PK’s. It was the Hulk and Bravo show during those incredible 30 minutes. Brazil just packed all their troops in Chile’s half and was resilient in their attack of the Chilean penalty area. Incredibly, the best chance of the 30 minutes of added time came from Chile. Pinilla with a long range shot that hits the crossbar with only minutes left in the game. It would have been the winner for sure, but it wasn’t meant to be, so off to penalty kicks they went. Still 1-1 after 120 minutes, penalties would be decisive in finding a winner. Brazil wins on penalty kicks and advances to the QF. The game started with both teams playing a cautious game and waiting to see what each other would do. These are two countries that know each other well from South America qualifiers and Copa America matches so there is mutual respect and that is visible in the way these two teams approached the game. Colombia controlled most of the game and possession, but they weren’t able to do much with it. The game was being played in the midfield and both teams were playing it safe, not trying to break through and get caught in the counter attack which is the main weapon of both these teams. Uruguay was resorting to long balls to Cavani, but they were being dealt with by Yepes & Zapata with ease. The way the game was going it was obvious that would take a stroke of genius to break the deadlock and at the 28th minute mark that genius sprung out of the bottle and his name was James Rodriguez. James Rodriguez chested a ball that was played into him, and one timed it with his left foot, pass Muslera and into the back of the net. This will be the goal of the tournament, and James Rodriguez is quickly making this World Cup the James Rodriguez show. Incredible player and he had now given Colombia the lead with a goal that came from the heavens. You could tell that Uruguay without Suarez, and down a goal against this Colombia with a very hot James Rodriguez, would be a team lost at sea, with no bite in them. Following the goal Colombia continued to press forward with quality passing and Uruguay continued to go with long balls to Cavani. Nothing would change for the next 15 minutes and they would go to halftime with Colombia leading 1-0. The second half had barely got underway and James Rodriguez was already scoring his second of the match to put Colombia up 2-0 in the game. Cross from Armero, Cuadrado with his head lobbies it for James, that in front of net just has to tap it with his right foot. Now, the feeling that this was the last nail in Uruguay’s coffin was sinking in. Sure there was a lot of game left to be played, but the way this team was playing you just felt like there was no chance they could come back from a 2-0 deficit. Uruguay took out Alvaro Pereira and Forlan, brought in Stuani and Ramirez, different names but much of the same. The game didn't change for Uruguay; they were unable of constructing am offensive play and string more than 5 passes together. Colombia continued to control the ball, the game, the score and by the looks of it this tournament. Cuadrado was the general on the field and James Rodriguez his best sharp shooter. 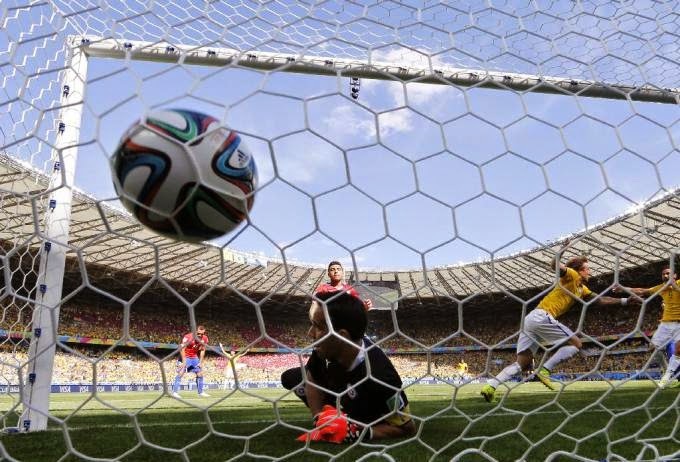 Uruguay would come close of scoring by Cavani with a low shot that the Colombian keeper finger tipped to corner. He seemed like the most unsatisfied player in Uruguay squad, looking for a goal that would bring life into his team. For what he did he deserved a goal, for what Uruguay did they deserved to go home, and indeed they are. The game came to an end and Colombia was the winner by a score of 2-0, both goals from James Rodriguez that now leads the tournament with 5 goals in 4 games. Colombia advances to the QF, they will play Brazil. Both Iain and Pedro had the exact result for the Colombia game, but Iain was the only one with Brazil advancing. The edge on today's predictions goes to Iain.